The word "apple" is the commonly accepted translation of tappuaḦ, from the root napaḦ (to exhale = the sweet-scented). It is of pleasant smell ("the smell of thy nose like apples," Cant. vii. 9 [A. V. 8]), and is used to revive the sick ("comfort me with apples, for I am sick of love," Cant. ii. 5). The tree offers a pleasant shade ("As the apple-tree among the trees of the wood, so is my beloved among the sons. I sat down under its shadow with great delight," Cant. ii. 3, Hebr. ; "I raised thee up under the apple-tree: there thy mother brought thee forth," Cant. viii. 5). It is mentioned also in Joel i. 12, together with the pomegranate; and it gave the name "tappuaḦ" to a number of towns (Josh. xv. 34, 53; xvi. 8; xvii. 7). "Apples of gold in pictures ["baskets," R. V.] of silver" are mentioned in Prov. xxv. 11. Whether so called because of their red color, or whether oranges are here meant, is uncertain. The Septuagint renders it μῆλον, a fruit "sweet to the taste" (Cant. ii. 3). In the time of the Mishnah the "tappuaḦ" was cultivated in large quantities and many varieties (Kil. i. 4; Ter. xi. 3; Ma'as. i. 4; TappuḦim of Crete, Men. 28b). Apple-wine is spoken of in Tos. Ber. iv. 1 and Ab. v. 12. 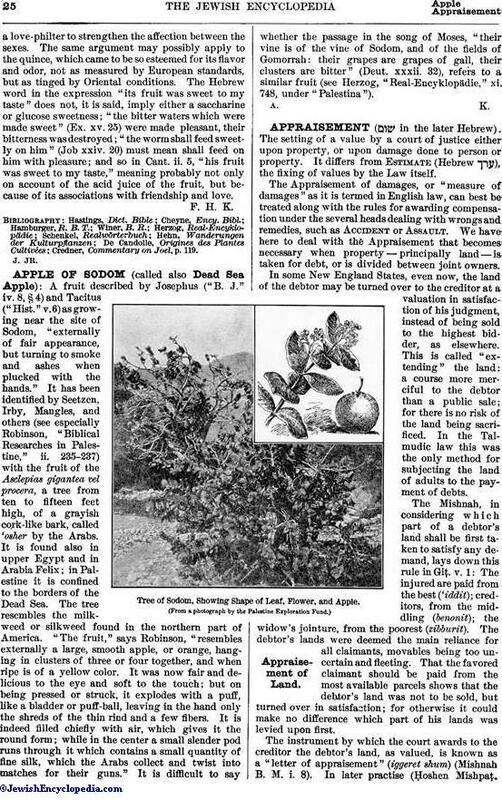 About the correctness of the translation of "tappuaḦ" there is a wide difference of opinion among botanists and linguists, especially as the Greek μῆλον, Latin malum, originally comprised the pomegranate, the quince, and other fruits similar to the Apple—all more or less symbolical of love, and therefore sacred to Aphrodite (see Hehn, "Kulturpflanzen," 1874, ii. 203-207). The Arabic name tuffaḦ is probably derived from the Syriac (see Frankel, "Aramäische Fremdwörter," p. 140). The tappuaḦ—distinguished in the Mishnah from the quince, which is called parish (Ma'as. i. 3), and from the Ḧazur (the crab-apple), (Kil. i. 4, Yer. Ter. ii. 3) —is declared by most authorities to be none other than the Apple that, if not as delicious as the European or the American Apple, is planted in orchards and near the houses in Palestine and Syria, and is especially prized for its aroma (see Credner, Commentary on Joel, pp. 135 et seq., who refers to Ovid's "Metamorphoses," viii. 676; Winer, "B. R."—following Robinson's "Researches," ii. 355, iii. 1295; and with reference to Josephus, "Ant." xvii. 7, [where its use in case of sickness is testified to by the story of King Herod] and to Avicenna, quoted in "Harmar," i. 369; Immanuel Löw, "Aramäische Pflanzennamen," pp. 155 et seq. ; W. R. Smith, in "Journal of Philology," xiii. 65). The Apple is handed to the sick or faint to revive them by its aroma. Rosenmüller ( "Handbuch der Biblischen Alterthumskunde," iv. 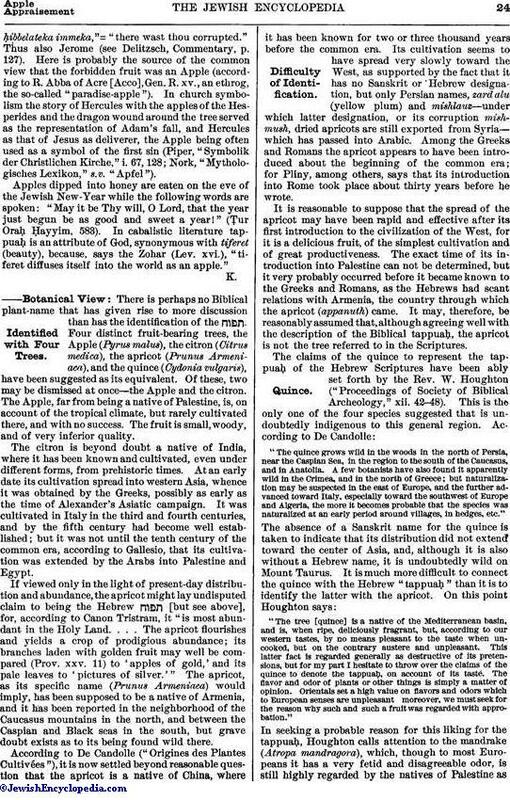 308) and Houghton (in "Proceedings of the Society of Biblical Archeology," xii. 42-48), however, seek to identify it with the quince, which, according to Post, "has a sour, acrid taste, and is never sweet." Others identify it with the citron (see Delitzsch's Commentary to Cant.) and the article "Apfel" in Riehm's "Dict. "); but the citron (a Persian fruit) was not transplanted to the Mediterranean shores before the common era (according to Pliny, "Naturalis Historia," xii. 3; Theophrastus, "Historia Plantarum," iv. 4). The same objections hold good against the identification of the Apple with the apricot, as proposed by Tristram, "Fauna and Flora of Palestine," p. 294. The Apple mentioned in Cant. ii. 3 is taken symbolically; see the following examples from Cant. R. ad loc. : "'As the apple-tree among the trees of the wood' offers no shade in the heat like other trees, so would the nations not seek the shade of Sinai's God; Israel only would sit under His shadow with delight. Or, 'as the apple-tree unfolds blossoms before leaves, so did the Israelites show their faith in God before they heard the message' [Ex. iv. 31: "And the people believed; and when they heard"]. The same applies when on Sinai they said: 'All that the Lord said we will do and hearken' [Ex. xxiv. 7, Hebr. ; compare with Cant. R. ii. 3, Shab. 88a, where the erroneous word piryo (its fruit), instead of niẓẓo(its blossoms), puzzled the Tosafists]. Or, 'as the apple-tree ripens its fruit in the month of Siwan, so did Israel display its fragrance at Mount Sinai in Siwan' [Ex. xix. 1, 2]. Again, 'as for the apple-tree the time from the first blossoming until the ripening of the fruit is fifty days, so was the time from the Exodus to the giving of the Law on Sinai fifty days.' Or, 'as for a small coin you may get an apple and derive enjoyment even from its sweet odor, so may you obtain your redemption easily with the help of the Law.' Or, 'as the apple excels in fragrance all trees, so does Israel excel the nations in good works.'" As the apple-tree among the trees of the wood, so even those that are void of merit are still full of good deeds, as the pomegranate is of seeds. The heathen are the trees in the wood without fruit, and Israel among them is as the apple-tree" (Yalḳ. Cant. 986). Ex. R. xvii. : "Why has God been likened to the apple-tree? Just as the apple offers its beauty to the eye without any cost, and has a delicious taste and perfume, so God's law (His mouth) is most sweet. He is altogether lovely." God had appeared to all the nations, but they would not accept the Torah, not realizing what is said in Ps. xxxiv. 9 [A. V. 8], "O taste and see that the Lord is good," and in Prov. viii. 19, "My fruit is better than gold, yea, than fine gold." But Israel said: "I sat down under his shadow with great delight and his fruit is sweet to my taste" (Cant. ii. 3). Also the words "Comfort me with apples" (Cant. ii. 5) are referred to the words of the Law, especially the Haggadot, which have delicious taste and fragrance combined like apples (Pesiḳ. R. K. xii. 101b; Cant. R. ad loc.). The Targ. translates "tappuaḦ" in Cant. ii. 3 "ethrog" (orange or citron); in ii. 5 and vii. 9 "tappuaḦ di gintha di Eden" (paradise-apple). In Cant. viii. 5 tappuaḦ is taken symbolically for Mount Olivet as giving forth all the dead at the time of the resurrection, or is taken for Sinai as in Cant. R. Aquila seems to take Cant. viii. 5 as referring to the fruit of the tree of knowledge, as he translates "shammahḦibbelateka immeka,"= "there wast thou corrupted." Thus also Jerome (see Delitzsch, Commentary, p. 127). Here is probably the source of the common view that the forbidden fruit was an Apple (according to R. Abba of Acre [Acco], Gen. R. xv., an ethrog, the so-called "paradise-apple"). In church symbolism the story of Hercules with the apples of the Hesperides and the dragon wound around the tree served as the representation of Adam's fall, and Hercules as that of Jesus as deliverer, the Apple being often used as a symbol of the first sin (Piper, "Symbolik der Christlichen Kirche," i. 67, 128; Nork, "Mythologisches Lexikon," s.v. "Apfel"). Apples dipped into honey are eaten on the eve of the Jewish New-Year while the following words are spoken: "May it be Thy will, O Lord, that the year just begun be as good and sweet a year!" (Ṭur OraḦ Ḥayyim, 583). In cabalistic literature tappuaḦ is an attribute of God, synonymous with tiferet (beauty), because, says the Zohar (Lev. xvi. ), "tiferet diffuses itself into the world as an apple." There is perhaps no Biblical plant-name that has given rise to more discussion than has the identification of the . Four distinct fruit-bearing trees, the Apple (Pyrus malus), the citron (Citrus medica), the apricot (Prunus Armeniaca), and the quince (Cydonia vulgaris), have been suggested as its equivalent. Of these, two may be dismissed at once—the Apple and the citron. The Apple, far from being a native of Palestine, is, on account of the tropical climate, but rarely cultivated there, and with no success. The fruit is small, woody, and of very inferior quality. The citron is beyond doubt a native of India, where it has been known and cultivated, even under different forms, from prehistoric times. At an early date its cultivation spread into western Asia, whence it was obtained by the Greeks, possibly as early as the time of Alexander's Asiatic campaign. It was cultivated in Italy in the third and fourth centuries, and by the fifth century had become well established; but it was not until the tenth century of the common era, according to Gallesio, that its cultivation was extended by the Arabs into Palestine and Egypt. If viewed only in the light of present-day distribution and abundance, the apricot might lay undisputed claim to being the Hebrew [but see above], for, according to Canon Tristram, it "is most abundant in the Holy Land. . . . The apricot flourishes and yields a crop of prodigious abundance; its branches laden with golden fruit may well be compared (Prov. xxv. 11) to 'apples of gold,' and its pale leaves to 'pictures of silver.'" The apricot, as its specific name (Prunus Armeniaca) would imply, has been supposed to be a native of Armenia, and it has been reported in the neighborhood of the Caucasus mountains in the north, and between the Caspian and Black seas in the south, but grave doubt exists as to its being found wild there. According to De Candolle ("Origines des Plantes Cultivées"), it is now settled beyond reasonable question that the apricot is a native of China, where it has been known for two or three thousand years before the common era. Its cultivation seems to have spread very slowly toward the West, as supported by the fact that it has no Sanskrit or Hebrew designation, but only Persian names, zard alu (yellow plum) and mishlauz—under which latter designation, or its corruption mishmush, dried apricots are still exported from Syria—which has passed into Arabic. Among the Greeks and Romans the apricot appears to have been introduced about the beginning of the common era; for Pliny, among others, says that its introduction into Rome took place about thirty years before he wrote. It is reasonable to suppose that the spread of the apricot may have been rapid and effective after its first introduction to the civilization of the West, for it is a delicious fruit, of the simplest cultivation and of great productiveness. The exact time of its introduction into Palestine can not be determined, but it very probably occurred before it became known to the Greeks and Romans, as the Hebrews had scant relations with Armenia, the country through which the apricot (appanuth) came. It may, therefore, be reasonably assumed that, although agreeing well with the description of the Biblical tappuaḦ, the apricot is not the tree referred to in the Scriptures. "The quince grows wild in the woods in the north of Persia, near the Caspian Sea, in the region to the south of the Caucasus, and in Anatolia. A few botanists have also found it apparently wild in the Crimea, and in the north of Greece; but naturalization may be suspected in the east of Europe, and the further advanced toward Italy, especially toward the southwest of Europe and Algeria, the more it becomes probable that the species was naturalized at an early period around villages, in hedges, etc." "The tree [quince] is a native of the Mediterranean basin, and is, when ripe, deliciously fragrant, but, according to our western tastes, by no means pleasant to the taste when uncooked, but on the contrary austere and unpleasant. This latter fact is regarded generally as destructive of its pretensions, but for my part I hesitate to throw over the claims of the quince to denote the tappuaḦ, on account of its taste. The flavor and odor of plants or other things is simply a matter of opinion. Orientals set a high value on flavors and odors which to European senses are unpleasant moreover, we must seek for the reason why such and such a fruit was regarded with approbation." In seeking a probable reason for this liking for the tappuaḦ, Houghton calls attention to the mandrake (Atropa mandragora), which, though to most Europeans it has a very fetid and disagreeable odor, is still highly regarded by the natives of Palestine asa love-philter to strengthen the affection between the sexes. The same argument may possibly apply to the quince, which came to be so esteemed for its flavor and odor, not as measured by European standards, but as tinged by Oriental conditions. 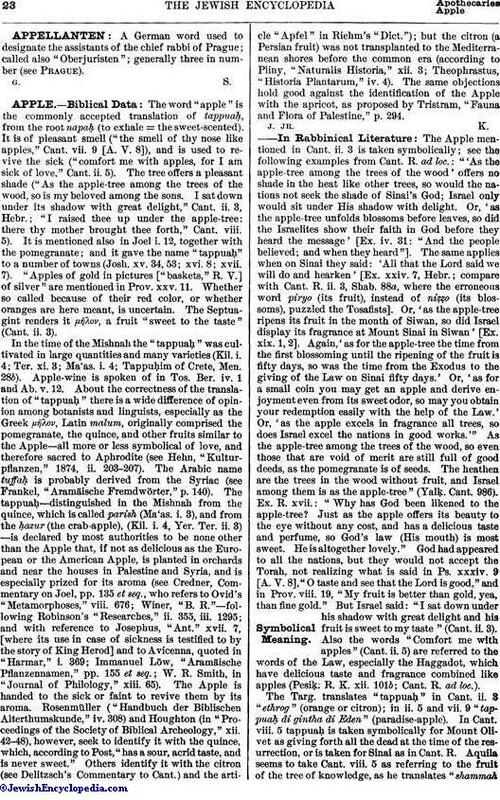 The Hebrew word in the expression "its fruit was sweet to my taste" does not, it is said, imply either a saccharine or glucose sweetness; "the bitter waters which were made sweet" (Ex. xv. 25) were made pleasant, their bitterness was destroyed; "the worm shall feed sweetly on him" (Job xxiv. 20) must mean shall feed on him with pleasure; and so in Cant. ii. 5, "his fruit was sweet to my taste," meaning probably not only on account of the acid juice of the fruit, but because of its associations with friendship and love. Credner, Commentary on Joel, p. 119.